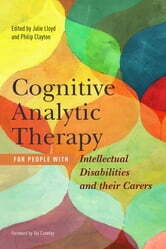 With a variety of case examples and contributions from experienced clinicians, this book introduces Cognitive Analytic Therapy (CAT) in practical, user-friendly language, and for the first time guides readers on how to use it with people with intellectual disabilities. CAT is increasingly recognised as an effective approach for working with people with intellectual disabilities. It focuses on observing and describing typical patterns of how the client relates to others, how they behave in relationships and how they see themselves. By considering how these patterns first developed and how they can be revised in a more constructive direction, CAT can encourage change to occur as the result of healthier relationships. The contributors describe in straightforward terms how CAT may be used with people with intellectual disabilities, and provide CAT tools adapted specifically for this client group. CAT and autism, CAT with people with intellectual disabilities in forensic settings and CAT with survivors of domestic abuse who have intellectual disabilities are also explored in detail. This is essential reading for any clinician wishing to use CAT with people with intellectual disabilities, including psychiatrists, psychologists, psychotherapists, social workers and support workers, as well as professionals across forensic services.